In an area where there is boil water advisory, residents and business owners are informed right away to boil water before using or consuming it. It means that the recent testing on the water system is contaminated, or there are technical problems in the water system and there could be health effects. Boiling water is a safe way to ensure that the water is free of contaminated organisms like E.coli bacteria. Drink tap water only after it has been boiled for at least one minute. After one minute, set it aside to cool and then drink. You may keep the rest inside the fridge in clean containers. If water is not boiled and cannot be boiled for whatever reason, using household bleach is another way to disinfect the contaminated water. Filter through a clean cloth and make sure to use ¼ teaspoon unscented bleach per gallon of water, mix well and let stand for a full 1 hour before using the water. If any of the two options given are not possible, bottled water can also be used. Purchase at the nearest grocery store immediately but expect empty shelves on your way there simply because people are likely “panic buying”. Can I Use the Contaminated Water in any of the Following? Bathing/Hand Washing: Using the contaminated water for basic personal hygiene is safe. Wash hands and body thoroughly and vigorously using soap then rinse and avoid getting water into your eyes, nose and mouth. Prior to food preparation, wash hands using (cooled) boiled water or bottled water. NOTE: Supervise little children while taking a bath to make sure they don’t swallow water. For persons with surgical wounds or any open wounds, use bottled water for washing the affected areas instead of boiled water until the boil water order is lifted. Dish Washing: For precautionary measures, after washing the dishes rinse it using bleach solutions. Allow dishes to completely air dry since most household dishwashers could not properly sanitize dishes with their temperature levels. Ice Cubes, Soda and Water Dispensers, Coffee Maker: If there is a boil water advisory in your area, never use tap water to wash dispensers and ice containers, coffee makers and when making ice cubes. Always use boiled or bottled water to make coffee, ice and cleaning or washing dispensers. Once the boil water advisory is lifted, these devices must be disinfected and sanitized to ensure that no organisms are left lurking on them. Household Pets: Use the same precautionary measures for your pets as you would for yourself. Refill pet water bowls using bottled and boiled water only. Washing Fresh Produce: Fruits and vegetables are to be soaked in bleach and water solution (1/4 teaspoon unscented bleach per gallon of water). Let them stand for 3-4 minutes and then drain using a strainer. How to Prepare for a Future Boil Water Advisory? 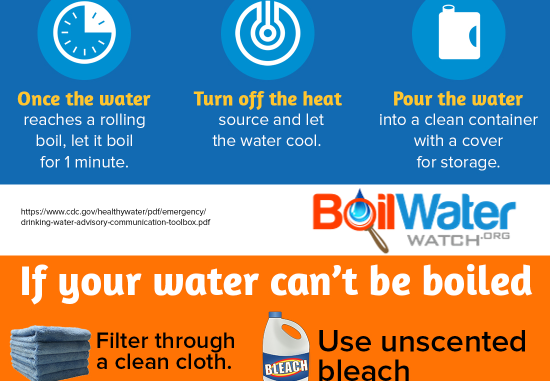 Do not let boil water advisories paralyze your normal activities. Be prepared at all times even when there is no boil water advisory. The aging water infrastructure in the country is enough reason for you and your family to be ready at all times. Expect more and more water main break incidents, contaminations and chemical spills in the coming months and years. Store 1 gallon of water per day good for one person and one household pet. Additional water must be stored for pregnant women, persons with disabilities, babies and sick persons. Replace store bought water every six months and always check the expiration date. Label bottled water using a marker to make it more visible. Store in a cool and dry place. Store at least a 2-week supply of water if possible. Have a ready stock of unscented household bleach at all times.